iDynamics® is the family of electronic commerce products and mobility that complements and enriches business environments around Microsoft's ERP. Integrate the entire operation of our company around our ERP. Allow more users to access to our ERP data. Optimize sales processes and access to information. Offer competitive advantages and added value. Business logic in the ERP. In particular iDynamics® Commerce allows you to offer your customers a B2B web portal in which is possible to do and request orders, applying the logic of rates and discounts that have been setup for each customer inside NAV. In case of having an abroad representatives force or to whom do not want to give access to NAV, Commerce also offers the tools for that kind of users to have access, from a simple portal and easy to use to the customers and where they can enter orders. 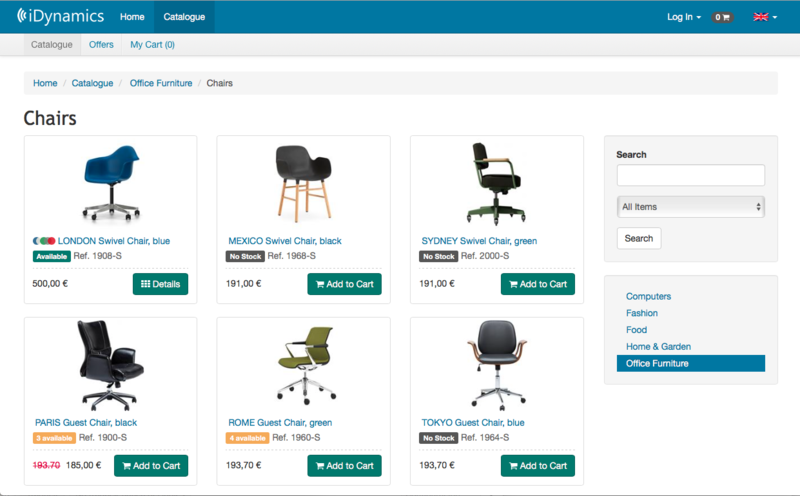 Allows you to navigate through the catalogue of the products of NAV with a similar interface as any virtual store. 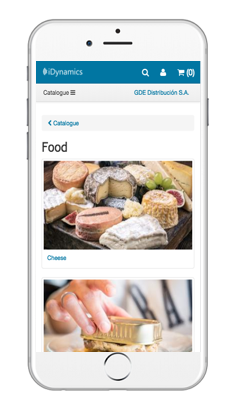 It has a browser of products and it allows you to add pictures, multi-language descriptions, technical documentation and other files attached associated to the products. Furthermore, it shows to the customers a list with the latest ordered products (from which we can order more units) and adds the possibility of highlighting products on offer. The portal is designed to be adapted to the size of the available screen, and to be used in a conventional way (with keyboard and mouse) and with touchable devices (mobile phones and tablets). Note: the portal is as well designed to be used with readers for blind. 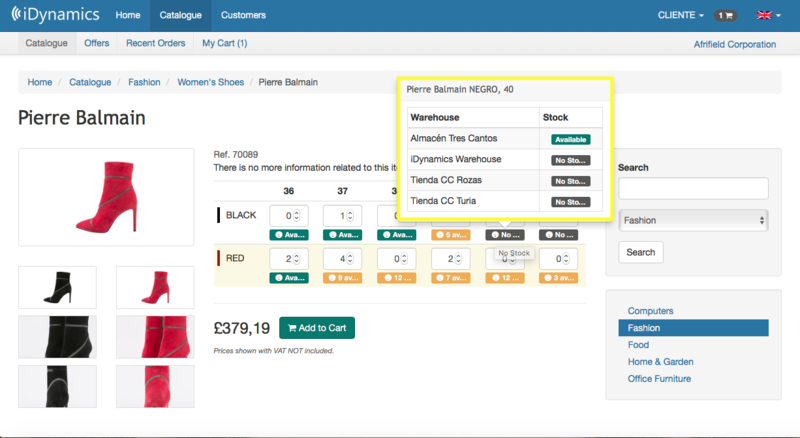 Multiple customizations can be made within the Commerce configuration display options, such as indicating whether users can see the available stock or not, and the prices that will be displayed during the navigation ( if an anonymous access option is enabled). Associated with the catalogue of the previous point, Commerce allows that the customers can do modifications directly against the ERP, applying in every minute the fares and the discounts that correspond to the connected customer (as well as the corresponding currency, in case of been working with multi-currency). 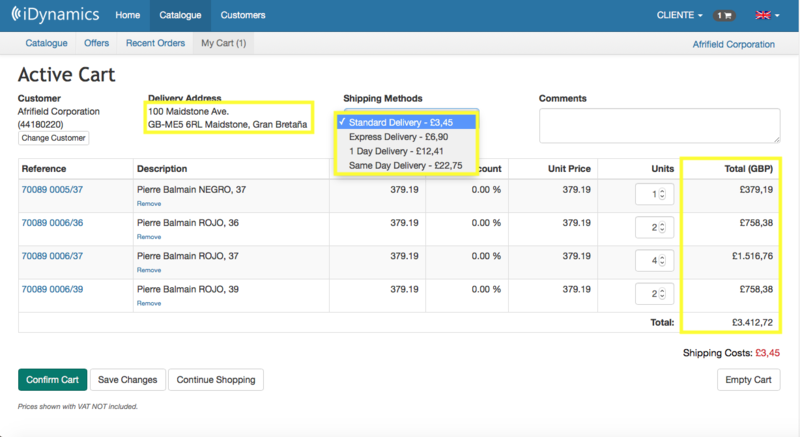 Added to NAV’s standard functionality, iDynamics Commerce adds the possibility of setting up the shipping charges, which will be added automatically to the orders according to the total amount and the destiny. 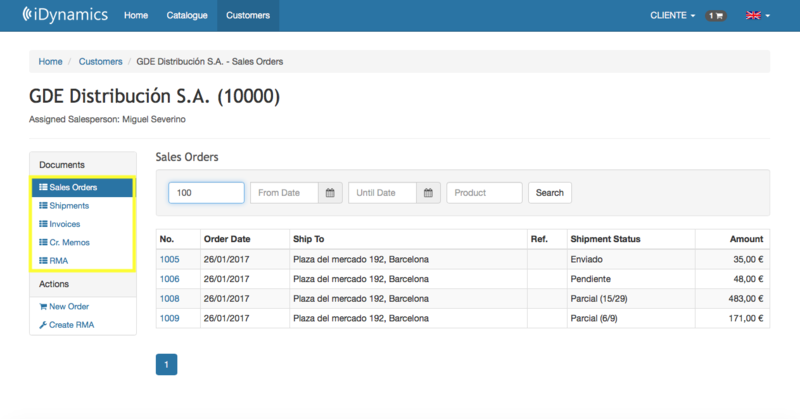 The customers can ask for request their orders, delivery notes, invoices and subscriptions from the portal; furthermore they can download these documents in PDF format (using the report design setup in the ERP). The aim of this area is to minimize the total number of inquiries received by the management department in the day-to-day, offering a portal in which the customers can request the status of their orders at any time. In addition, from the requests of the mentioned documents, it is possible to copy, from this area, purchases orders (create a new one from a previous one), recalculating rates and availability of the products) and request the status of the shipments (in the cases where the driver used, provide a URL to track with). In case this functionality is activated, Commerce will allow the registration of a new user on the web, as well as the creation of orders created by the users. Internally these new users will create a new user as a Web Customer and the received orders will be assigned to a customer that sale to the public, from which after, we will take the fares. 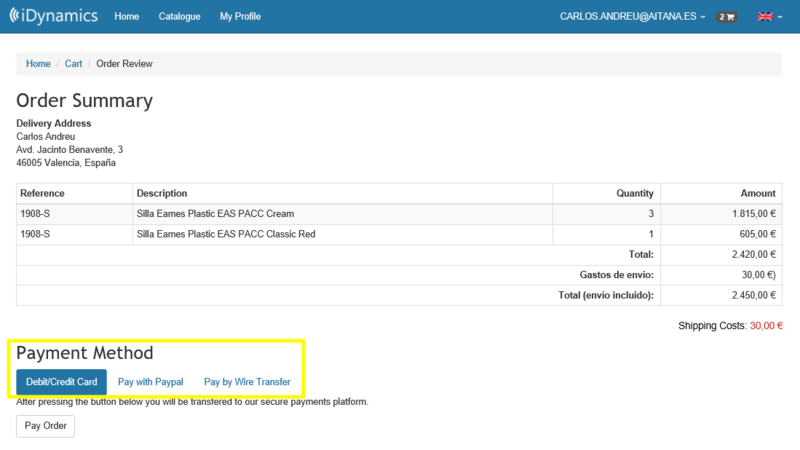 When the public store is activated it is possible to activate the different ways of payment (PayPal, bank gateway, transfer) supported by the application. Note: the payment by credit card through the bank gateway usually requires a few small customizations depending on the data of the gateway engaged. The representatives area allows those users to ask for the data of all your assigned customers, and also the creation of orders. Note: the link between a representative and his customers is made through de seller field, that exits in the customer NAV’s card. Commerce allows you to assign several representatives to the same user, for the cases in which it is required to have a zone chairperson or a similar position, with access to customers of all of them, and also to the cases in which a user is feeling under the weather or on holidays and a colleague must take care of his/her customers. One of the configurable profiles in iDynamics Commerce is the user profile of the Call Center. It is a similar profile to the representative one, but with access to all the customers of the system. Talking about licenses level a Call Center user will require the same license that to access to NAV (Limited User), but using Commerce allows you to access through a more familiar and somewhat more agile interface (for the sales process), without having the necessity of training. iDynamics Commerce displays the rates of the products in the currency that corresponds to the customer on whom the order is being placed at any time. The portal will apply la tariff in the customer’s currency, if and in its absence, the rate in local currency, applying the different currency exchange setup in the Currency NAV’s table. Note: Commerce always rounds down to two decimals above the price by product unit. It is important to be aware that the objective of iDynamics Commerce is not to replace Dynamics NAV’S web customer, but for offered to the customers an access to their data and to the incoming orders. Even in the representative access and Call Center users, the goal is always to offer an agile and simple interface, not the whole functionality of the ERP. Generally speaking, if there is any NAV functionality used by the customer, that it is not directly mentioned in this document, it is recommended to request if it is supported by Commerce, or if it is required any particular customization. As examples of NAV functionality not supported de series by iDynamics Commerce, are the introduction of quantities with decimals or de multiple lines of sales of the same product (the total is always accumulated in a single line), or the stock reservation when you create a new order. In most cases, the reason for this is very simple: to avoid customers from being able to introduce mistaken orders. Besides that, it is important to take into account that the functionality of iDynamics Commerce, depends on the version installed, which at the same time is related to the version of Dynamics NAV’s server to which it is connected. For instance, iDynamics Commerce v2 (NAV2013), it does not have available the functionality of downloading in PDF format the documents of sales in PDF format with the Dynamic NAV design. iDynamics Commerce is also available through native Apps of Android and iOS. 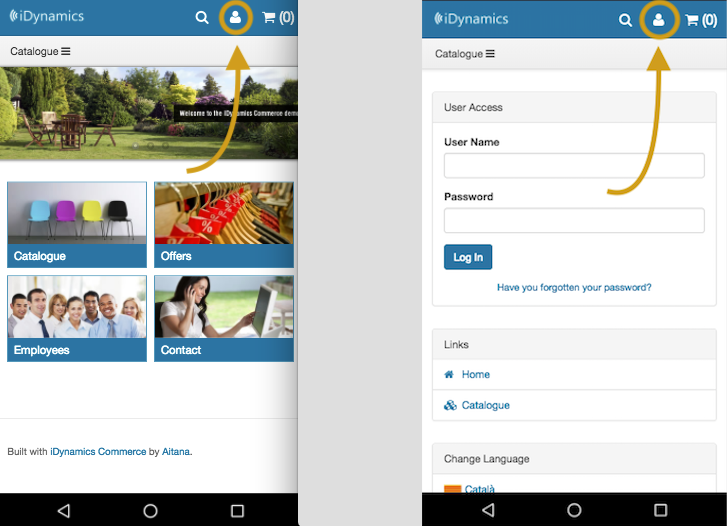 To do this, in the Google (Play Store) and Apple (App Store), you will find the iDynamics Commerce "application that you can install on your devices (smartphone or tablets) and that by providing you with the necessary connection data, you will be able to access the services of iDynamics Commerce. Through the App installed on your device, you will have the same functionality as through a browser. You should keep in mind that this application, like in the web version, shows the information (products, prices, invoices, etc.) in real time, so you will need to have Internet connection. One of the aims of the native application is that those who purchase iDynamics Commerce can adapt it and create a new application, with its logo and corporate image, to offer its customers through Google Play and the App Store.